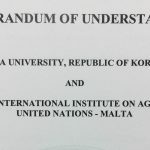 A Memorandum of understanding (MoU) was held between the International Institute on Ageing, United Nations -Malta (INIA) and CHA University, whereby both parties agreed on mutual collaboration and to organise training programmes on ageing so as to increase the capacity building. The Department of Age-friendly Industry of CHA University was selected as a ‘Special Graduate School on Age-friendly Industry’ by the Korean government’s Ministry of Health and Welfare in 2015. The department aims to educate a new generation of professionals who specialize in the age-friendly industry, particularly in age-friendly businesses and life consulting. 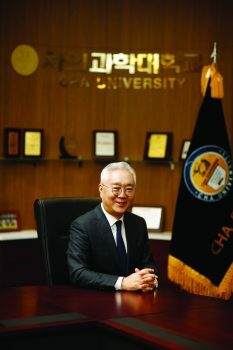 The department provides master and doctoral degrees; all full-time students will get a 100% covered scholarship from the Korean government.The curriculum is comprised of three main stages: 1) foundational courses, 2) advanced courses, and finally 3) internships and practicum in both domestic and overseas institutions. CHA University has strong and extensive resources dedicated to education and research – something that certainly factors into the Department of Age-friendly Industry’s long-term success. The CHA University has world-class knowledge and technology in Healthcare and Medicine, and is a very unique university in terms of its focus on integrating three core verticals: Institutions that develop basic disciplines, hospitals that apply the knowledge from the basic disciplines with clinical trials, and enterprises that commercialise them. 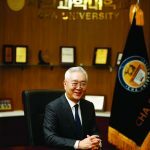 Such a competitive advantage truly differentiates CHA University from others in the field, and ensures that CHA University remains the institution best suited to educating and producing specialists in the field of age-friendly industry both domestically in Korea, and worldwide. Please join us in our efforts to respond to increasing amount of global population ageing issues by building and developing the age-friendly industry.